Most sports need some kind of instruction to be enjoyed to the full and to be safe. 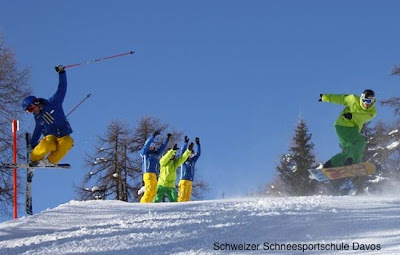 And nowhere is instruction more important than in skiing and snowboarding which are conducted often at considerable speed, in unpredictable terrain and in the company of many other snowsports’ enthusiasts. Every ski resort has a professional ski, snowboard or snowsports school dedicated to introducing novices in group classes to both sports and offering improvement clinics for more advanced participants. There are also private instructors and mountain guides available at every level. Even experienced skiers enjoy having guides when embarking on new terrain. Lessons in technique teach the skier balance, control, how to slow down, how to stop and how to keep out of trouble. Also, instruction helps you ski with the least physical effort. Without technique tips, you could be expending far too much energy unnecessarily - by using force rather than correct body position - and end up exhausting or injuring yourself and possibly others. 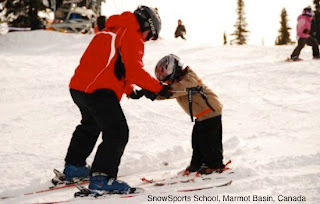 Ski instruction tactics change over the years as well as from country to country so you may not be taught all of these stages or they may be given different names. 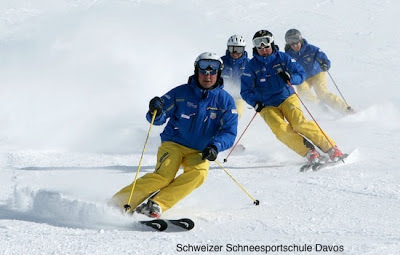 Rebekka Vögeli, a ski instructor and administrator with the Schweizer Schneesportschule Davos estimates that it takes around three days for a skier to progress from the easiest runs - ‘green’ runs - to tackling an intermediate or ‘blue’ run. From there it may be many more weeks of skiing before black diamonds are possible. Much depends on the fitness of the individual as well as their courage. “Children should be about three years old before they start learning to ski,” says Vögeli. “And if a person is healthy, can walk and do some sports, he is not to old to ski” - so there is no maximum age. Davos, the highest city in the Alps, is a great place to learn. It has dedicated beginner slopes as well as many intermediate and advanced choices. There are also jumps, rails, halfpipe and a “monsterpipe” for learning freestyle skills. “We have some good practice areas and nursery slopes for beginners and our ski instructors are well trained,” says Vögeli. She also advocates the famous Swiss resort for its wellness facilities and varied nightlife: a great way to recover from the spills and thrills of the ski day. Snowboarding is quite different from skiing, more like surfing or skateboarding with a sideways stance. There are no poles to help balance, turn or push along the flats with. This means that some traverses, catwalks or paths can be quite challenging for snowboarders who have to rely on momentum from the previous slope or resort to taking the board off and walking in order to reach the next incline. However, snowboarding in general is easier to learn than skiing, says Rebekka Vögeli, an instructor and administrator with the Schweizer Schneesportschule in Davos, a Swiss mountain town established in 1213. Kids can start around age 5 or 6, Vögeli recommends, and adults can learn at any age: “If the person is healthy, can walk and do some sports, he is not too old,” she says. 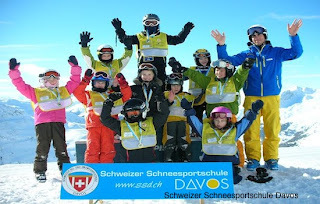 Vögeli has worked at the Schweizer Schneesportschule in Davos for the past five years. Parsenn DavosKlosters has been a classic skiing mountain for more than 80 years, with undulating, wide runs and mountain huts redolent with authentic local foods and Alpine culture. It is the largest snowsports resort in the area with pistes for all standards, boasting a 12 km run as well as illuminated night-skiing every Friday from the Rapid chairlift. 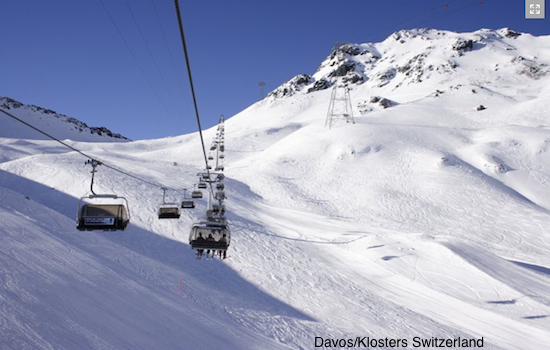 It is served from Davos by a funicular railway, built 80 years ago, and from Klosters by the Gotschna cable car. From the Totalp Lift snowboarders can access a boarder cross run at Parsenn and there are two more at neighbouring Madrisa and Pischa. There are also several snowparks with jumps and rails, a halfpipe and a “monster” pipe in the area. All the separate hills are linked by a free local bus system. How come some skiers can cope with extreme cold while others cannot? It all comes down to clothing and equipment. Cold affects everyone in pretty much the same way, although there is plenty of research to suggest women's extremities get colder quicker than men's. The biggest tip for keeping warm is to layer against the cold. Start with a really high-tech ski jacket, add a cosy mid-layer and down vest, and invest in high-performance thermal underwear. Wool socks are a must, as are a balaclava or face mask, neck warmer and good mitts. Well-fitting ski boots also help as they facilitate circulation flow. Toe and hand warmers -- available from drugstores and sports shops -- are beneficial, and it's best to put them into boots and gloves 30 minutes before going outdoors. However, for really warm extremities, the most effective boot heaters these days are lithium-powered. Over the past few seasons, battery boot heaters have become increasingly popular and more readily available. Top Shelf Snowsports at Fernie, for example, fits the Therm-icclimate control system in ski and snowboard boots. It involves just half an hour of work (and around $300 outlay for equipment and installation), and can be fitted to any brand of boot. They can even cross over to regular boots for ice-fishing, hunting, outdoor winter work and other sports. Brian Campbell has been working with custom-made boots for more than 20 years at Whistler and Fernie. He says boot heaters will soon be the norm for every skier. "The longer you've been skiing, the worse condition your feet are in," he says. Campbell attributes this to regular freezing rather than the years of wearing ski boots. "Once your toes become frozen a few times, they lose about 30% of their heat," he explains. The newest boot heaters are not bulky or uncomfortable. The slim-line heating element slips into the boot footbed and is covered by an insole which is tailored to fit into any boot shape or size. If the element can be felt through the footbed, then punching out is sometimes necessary. The rechargeable lithium battery pack is attached outside at the rear of the boot. The wiring from the element to the battery is run through the bottom of the liner and up through the back of the boot. There are various temperature settings. In Fernie, the heaters are increasingly appealing to mountain workers, instructors and skiers who have to stand around in the snow, waiting for kids or lesser-ability ski buddies. Instructor Shawn Clarke ordered a set when he saw how beneficial they were for other instructors. "More and more of us are getting them as we have had to endure frozen feet so many times," Clarke says. He teaches all ski levels at Fernie, as well as running the advanced Steep and Deep Program. These could be the ultimate gift for ardent skiers in your family. And for Christmas kudos, there are remote controls and an extension cord which helps maintain the battery during hyper-cold weather. Therm-ic offers Power Gloves with integral lithium ion batteries and Burton, Volcom and North Face also make heated ski jackets. SNOWBOARDING FOR THE OVER 40s? Females of a ‘certain age’ are not usually associated with the youthful sport of snowboarding. So, what happens when a woman of 41 suddenly decides to take up the physically punishing sport? Lots of bruises and cricked necks, according to Calgary’s Dawn Urschel, who was attracted to snowboarding after turning forty. “People have asked me if it’s a midlife crisis but it wasn’t something I was trying to fit in because I was getting older,” says Urschel. Other snowboarders are shocked when they see her getting ready in the lodge, putting on knee pads, wrist guards and helmet for damage limitation. Urschel says it’s the men, in particular, who are surprised to see someone of her age on a board. With only 14 percent of boarders in the 35-49 age-group, it’s no wonder she gets a few raised eyebrows. Canadian Ski Council statistics also show that only 30 percent of all snowboarders are female. But no-one has taken the trouble to work out how many boarders over the age of 35 are female – possibly because there are so few. She was motivated to persevere with the grueling sport because she didn’t want her husband to progress and leave her behind. “I advanced a little quicker than him at times because I had the chance to take more lessons,” she explains. 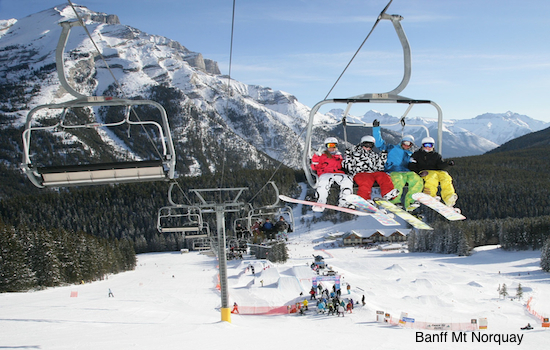 Initially, the couple took advantage of a lesson, rental and lift ticket package at Sunshine. 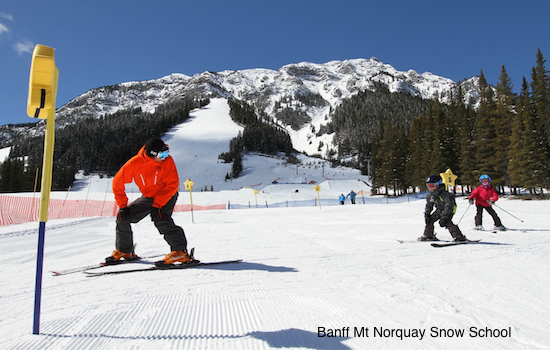 Urschel continued with courses at Nakiska and Canada Olympic Park when she volunteered to help out on her daughters’ school snowboarding trips. “That extra tuition really helped me improve and now I can keep pace because I push myself beyond my comfort level,” she says. Boys in her daughter, Vanessa’s Grade 9 class were “blown away” that a mother could actually learn to snowboard with them and the 19-year-old instructor wished that her own mom would consider taking up the sport. Urschel, who also teaches aqua aerobics and enjoys Pilates and yoga, admits she’s a bit of a daredevil. “Now I can go around the whole hill, challenging myself, getting into a rhythm that feels just like dancing,” she says. One of the best things about the sport is being able to share it with her daughters. “It was amazing to be riding up the chairlift with Vanessa on her sixteenth birthday. I wouldn’t have believed it four years before.” Now her younger daughter, Sydney is also hooked on boarding. This boarding baby boomer, now turned 50, has been buying season’s passes at Sunshine for the past four years. Her future goal: to keep snowboarding as a companiable winter sport when the couple are empty nesters. “Beats taking up golf,” Urschel quips. Fear is the biggest barrier for women taking up either snowboarding or skiing. Snowboarding is considered more reckless by many women, says Langley. Her advice for females of all ages is to take lessons and persevere for at least three days. The benefits – getting to see the mountains from a totally different perspective with a feeling of freedom while keeping fit and toned. A typical ski lodge, particularly at weekends, is seething with snow bunnies, snazzy snowboarders and fresh-faced freeskiers, enough to make you feel ancient if, like me, you’ve been skiing since the 70s. You could resort to camouflaging yourself among the families in the cheap and cheerful picnic areas. But what most of us baby boomers really crave is a ski destination where they can feel at home and part of the in crowd. Hence my delight at finding Aspen Snowmass so predominantly mature. 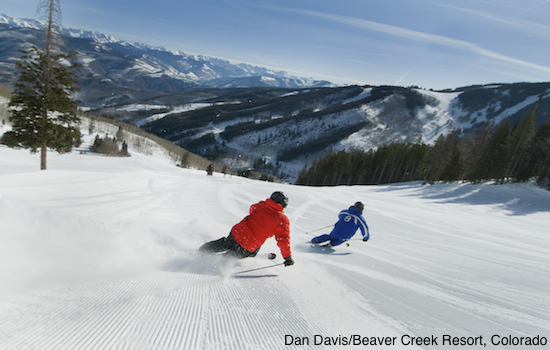 Whether because of cost, cachet or culture, the baby boomer reigns in the Power of Four resorts, particularly Aspen itself and the nearby ski playground of Snowmass. Having gazed on the glitz and glamour of Aspen itself last year, I opted for onhill convenience at Snowmass Feb 24-Mar 2. Serendipitously the first big snow week of a slow snow season, it dumped big time before I arrived. There was a small window of clear weather to guarantee me a smooth transfer from Denver via the Colorado Mountain Express van complete with Wi-Fi and a Starbucks stop. And then it proceeded to snow every other day during my stay. Warming my hands at the tabletop firepits at Venga Venga the first night, I noticed that the après ski clientele didn’t make me feel like a perennial parent. 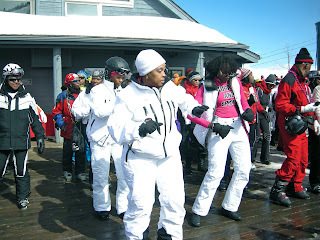 And next day on the mountain, I was gratified to be surrounded by seasoned skiers everywhere I went. Yes, the lifties and waiters were typically youthful, but lots of ski instructors – as well as their flock - were seniors (55-plus in the USA) and the Ski Ambassadors were all retirees. With Snowmass sporting 94 trails and 21 lifts over 3,332 acres, it’s a great idea to take advantage of the Ski Ambassador service the first morning. Free of charge, tours run everyday from the confluence of Sam’s Knob and Village Express chairlifts from 10:30 am for a couple of hours. There is also an info area right by the massive piste map as well as free cider and granola bars. If you’re a single skier or just like company and local guiding, you can take as many tours as you want. You specify which level of skier you are (eg green runs, blue or black) to help form homogenous groups. Although the hosts can’t legally take you on any black terrain, they will happily point out all the best diamond and double diamond areas, showing you all the sneaky accesses. There is even a run called Sneaky’s and the Glades off it turned out to be my favourite fun run – just the right width between trees for excitement without terror, a fence line to prevent plunges into the wilderness, and oodles of untouched powder and champagne bumps. Having picked the week after the President’s Day Weekend public holiday and outside of typical college breaks, Aspen Snowmass was delightfully un-crowded but by no means deserted. Skiing and around town, I met hundreds of African American skiers celebrating the 40th anniversary of their ski association – the National Brotherhood of Skiers. Although they had members of their youth development team with the 3000-throng, their age-group was definitely 30-plus, tending toward the baby boomer bracket. Chatting on chairs I also unearthed a 300-strong Chicago ski group as well as 40 Kiwis there for a two-week stay in the Roaring Fork Valley. Again no spring chickens! Anyway, all this age-friendly atmosphere made me start pondering (over home-made melt-in-your-mouth cookies at Up 4 Pizza): what do Baby Boomers really want from a ski holiday? And how does Aspen Snowmass satisfy these needs? Well, first of all, same as any age-group, we want great skiing with a broad variety of runs from easy groomers to difficult double diamonds. We tend to have a lot of ski mileage under our belts, so we don’t want boring blues all the time but we need some of these for knee-friendly warm-ups and end of day cruising. Longshot is perfect for this. A 5.3 mile (8.5km) long run on the far left of the piste map, it has a bit of climb to get into it if you want to access it right from the top. For the less altitude-fit, you can ski in further down. But this hike element seems to deter the multitudes and, reveling in a foot of pristine powder on top of a groomed base, I had the whole five miles to myself. The hike also accesses the brand new Burnt Mountain Glades - one of those out-of-bounds areas all the locals hiked to anyway. Another low-flow area is Campground, on the far righthand side of the map, where no-one seems to bother skiing. I found a lovely corduroy cruiser there as well as challenging soft bumps on Slot. Boisterous barking near the bottom warns you about carefully crossing the dogsled track. A good baby boomer venue also needs pipes and parks. Not so that we can indulge our inner aerials but so that all the youthful snowboarders and twin-tippers can gravitate towards those athletic attractions, preserving the powder for us. Voted number 1 Park by Transworld Snowboarding Magazine in 2012, Snowmass has 90 features over three separate parks as well as a Superpipe. There’s also a jump on Fanny Hill to which the gungho gravitate on Fridays for competitions. Plus there’s a Boot Camp Park and Fun Zones scattered around the slopes as well as a tandem race track at Spider Sabich picnic hut (named after a famous local racer). Great snow is even more vital as we age. That rutted, over-skied, re-frozen icy stuff or stodgy wet powder which many lower-altitude resorts feature is no good for post-surgery knees or dodgy backs. But, with the onslaught of climate change and a discernible contraction of the ski season in lower destinations, where can we guarantee this? At over 12,000 feet (nearly 4,000 metres), Aspen Snowmass is more likely to get light, fluffy powder during a typical season. 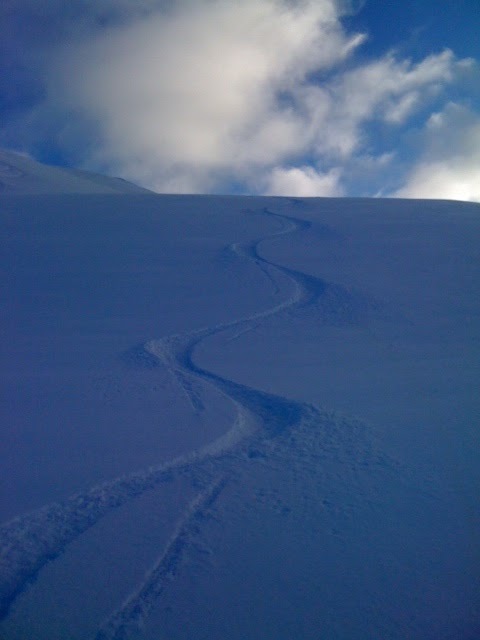 Hitting an off-peak week, with regular replenishment of snow, meant I was able to ski powder into the afternoons most days and even find secret stashes on the way home at 3 pm. Which leads me to my home-from-home at the Crestwood Condominiums. What luxury to ski straight back to a cozy condo at the end of the day or even for a leisurely lunch on the balcony. So many resorts involve an arduous trudge or bus trip back to bed. The Crestwood is smack bang on the hill with access to the slopes and village either side of the building. In the morning you exit at the ski rental shop having left your skis with the ski valet, perhaps having an overnight tune-up. In the evening you can ski directly from the après ski bars at Snowmass Mall to the condo forecourt. If you are supping or shopping further down the slope at the village base, you can catch the village gondola and then pole across the piste. It’s no good, though, being ski in/out if you are then marooned all night on the slopes with no easy way of getting to and from restaurants, shops and other activities. Aspen Snowmass has pre-empted this problem by providing a free shuttle bus service all day long until 2 am. The drivers are mainly boomers, by the way, and a fount of information and gossip about the area. The Crestwood has a warm waiting room complete with ski magazines and brochures for this bus service but also provides its own private shuttle at no charge for anyone who wants to get around town – you might want to tip though. There is also a service from the heated transportation centre linking Snowmass with Aspen, Aspen Highlands and Buttermilk. And your ski pass is valid for all these areas adding further variety to both the ski offering and nightlife, particularly useful if you have chosen a two-week or multi-centre holiday. 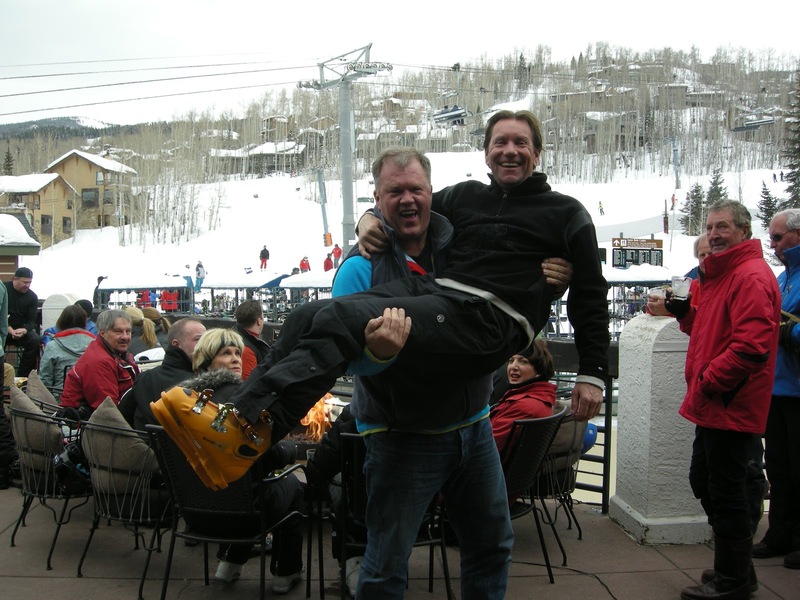 Throughout Snowmass the accommodation is high quality with all the American add-ons. You can choose from a diverse range of hotels including, at the top of the tree, the fancy-pants Viceroy Snowmass whose Eight K restaurant features a sparkling 87-foot glass bar as well as fur-trimmed décor. Or you can go self-catering – not like the confined, cheap and cheerful French equivalent but at condos with cachet like the Crestwood. The richly renovated 1970s property has underground heating in all the walkways and forecourt, so no slipping on snow. It also has a full-service front desk, conference rooms, gym for stretching and an outdoor hot tub area landscaped with rock and waterfalls. Brandishing beers, wine or rehydrating water, this was always full of the over-50s swathed in matching Crestwood bathrobes when I was there. Among the 100 Snowmass bars and restaurants, there are eateries for everyone. The Artisan at the Stonebridge Inn is renowned for its locally-sourced fare as well as the comedian and magician, Doc Eason, who entertains at the bar on Tuesdays and Thursdays. The village abounds in early evening live entertainment with DJs and bands at venues such as my favourite, Venga Venga (where free nachos and dip come with happy hour drinks), the Westin, and Sneaky’s Tavern. You can ski all day, drink and dance from 4 -6, go home to shower, eat dinner around 7 and still be in bed by 9 ready for the next day’s activity. For custom pizza and great salad, there’s Slice in the quaint red-roofed barn building which has opened this season. It is run by David Dugan who also owns the Base Camp next door, a lively après ski and late night bar that appeals to the younger crowd. 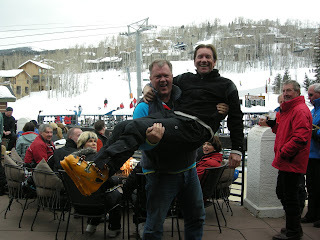 And for upmarket Italian, check out Il Poggio, recommended to me by Snowmass mayor, Bill Boineau. But those of us who want to sustain our ski longevity can’t eat rich food every night. In fact, I heard lots of senior skiers in the lodge talking about going on doctor-diagnosed diets while munching guiltily on greasy burgers and fries! If you choose a condo, with full kitchen plus massive fridge-freezer like I did, you can self-cater courtesy of the Village Market a couple of minutes away on the bus. And the Crestwood chauffeur will come and pick you and your groceries up rather than have you wait encumbered at the bus stop. Good service is another prerequisite: we can be more demanding of respect and manners as we age. Aspen Snowmass has training down to an art and I never felt too “have-a-nice-dayed” but, instead, impressed by the genuine helpfulness of local workers. Perhaps in an area full of older, rich and famous people, everyone is more inspired to be nice to people as you never quite know who you are talking to. Roman Abramovich (Chelsea’s rich Russian owner) has four houses in Snowmass as do many stars of business, film, sport and music. If you choose to have a day off from skiing, you could indulge your voyeurism on the Rich and Famous Tour, visiting dozens of decadent second (third or fourth) homes owned by the likes of Kevin Costner, John Denver, Robert Wagner and Jack Nicholson. If you’re manic about massage during your ski trips, the spa at the Westin was recommended to me by Andrea Smoak, a wannabe skier from Virginia. Touring the Aspen area with her husband, Richard, she was checking out the ski scene for a future vacation. Although she didn’t ski this time around, she was able to enjoy all the social side-lines, visiting Elk Camp mid-mountain restaurant by gondola for the restaurant and outdoor heated Prosecco bar which opens for evening activities every Friday until 9pm. For non-skiers, the Mammoth museum in Snowmass Mall exhibits pre-historic bones from a peat bog unearthed during routine ski-hill excavations. A visit to Aspen is also a must for more museums, art galleries, designer duds and vibrant venues. And you just might end up sitting next to Goldie Hawn, Don Johnson or Johnny Depp at the newly renovated Hotel Jerome bar. Excellent and helpful post… I am so glad to left comment on this. I found it impressive and very informative. Thank you for sharing such a wonderful experience of snowboarding with us.